The expansion of earlobe piercings requires certain equipment. That section showcases the basic tools it all started with. All straight expanders have a conical shape in common, making it especially easy to gradually keep stretching for a particular time. Our blog will teach you more about the details of healthy stretching. On the one hand the diversity of expander materials covers classic choices like surgical steel 316L and acrylic. On the other hand you can find options like wood, horn or bones that display more of an organic flavour. Steel already starts at a diameter of 1mm. Expanders made of acrylic even hit an incredible size of 30mm in diameter. Alongside the remarkable shape different colours and designs enforce people to look at. Whether glow in the dark or rainbow designs, crystals or imprinted skulls - any taste is represented at Flesh Tunnel Shop. All beginnings are difficult. Like with all other things this is valid for ear stretching as well. But the good news is: Our ear stretchers are at least as cool as our other tunnel jewelry. :-) This way you can wear stylish tunnel jewelry even during the stretching process. 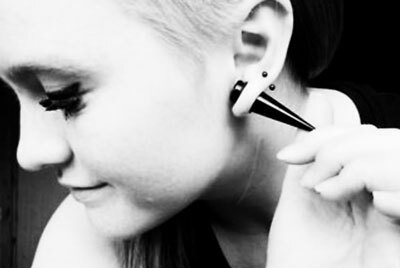 Ear stretchers (tapers) work like this: You select your prefered size. For expample this might be 3 millimeters. As a first step you remove the screw from the taper. Afterwards put the expander on the flesh tunnel, stretch your earlobe piercing until the tunnel is placed into it. As a final step just remove the expander from the tunnel and close the flesh tunnel by screwing the other side on the jewelry. In our tapers shop we offer a large variety of different kinds of tapers made of various materials. The most popular one is the black acrylic 2 in 1 expander set. The set consists of one screwable expander and a flesh tunnel. This way you get all you need for a good ear stretching start for a great price. These expander sets are available from 3mm to 25 millimeters. At least as popular at the moment are the silver or black steel tapers. These are very stylish and will perfectly fit to any colour of your clothing. They are made of 316L premium surgical steel which is perfectly suitable to manufacture tunnels, plugs and tapers out of it. Acrylic piercing tapers are available in many different colours here in our flesh tunnel expander section. Some examples of these are: white, dark blue, yellow, green, light blue, transparent, violet, pink, purple and red. Of course you can also get various multicloured ear tapers in our shop. These are very unique and are a perfect way to stress your individual personality. If you want to be seen in the darkness of a cool party or at a concert maybe our glow in the dark tunnel tapers will be perfect for you. They are self-luminous whicvh means that they charge themselves when you wear them during daylight. No matter what kind of ear stretchers you prefer we offer various different kinds of them here. Just select your favourite one and enjoy your new expander jewelry.